The following fields will be added to the input. If the fields already exist, the field values are updated. The Object ID of the closest near feature. If no near feature is found, the value will be -1. The distance between the input and near feature. The value is in the linear unit of the input features coordinate system, or Meters when the Method parameter is set to GEODESIC and the input is in a geographic coordinate system. If no near feature is found, the value will be -1. The catalog path to the feature class that contains the near feature. This field is only added to the output table if multiple Near Features are specified. If no near feature is found, the value will be empty string or null. The following fields will be added to the input features if the Location parameter is checked (location parameter set to LOCATION in Python). The field values are updated if the fields already exist. The unit of the values of the fields depend what method is selected on the Method parameter. If set to Planar, the value is in the linear unit of the input feature's coordinate system. If set to Geodesic, the value is in the geographic coordinate system associated with the input feature's coordinate system. X-coordinate of the location on the near feature which is closest to the input feature. If no near feature is found, the value will be -1. Y-coordinate of the location on the near feature which is closest to the input feature. If no near feature is found, the value will be -1. The following field will be added to the input features if the Angle parameter is checked (angle parameter set to ANGLE in Python). The field values are updated if the fields already exist. Angle of the line at the FROM_X and FROM_Y location which connects the input features to the near feature. If no near feature is found or the near feature intersects the input feature, the value will be 0. The values for NEAR_FID and NEAR_DIST will be -1 if no feature is found within the search radius. 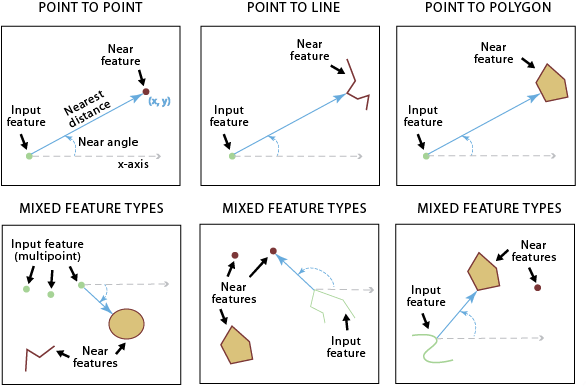 Both input features and near features can be point, multipoint, line, or polygon. The Near Features can include one or more feature classes of different shape types (point, multipoint, line, or polygon). The same feature class or layer may be used as both input and near features. In this situation, the input feature being evaluated is excluded from the near features candidates to avoid all features being closest to themselves. The input features can be a layer on which you have performed a selection. The selected features will be used and updated during the execution of the tool. The remaining features will have the values of the newly created fields (such as NEAR_FID and NEAR_DIST) set to -1. When more than one near feature has the same shortest distance from an input feature, one of them is randomly chosen as the nearest feature. When using the Planar option for the Method parameter, the input features should be in a projection that is appropriate for distance measurement, such as an equidistant projection. To visualize the FROM_X, FROM_Y, NEAR_X, and NEAR_Y locations, the output table can be used as input to the Make XY Event Layeror XY To Line tools. The input features that can be point, polyline, polygon, or multipoint type. One or more feature layers or feature classes containing near feature candidates. The near features can be of point, polyline, polygon, or multipoint. If multiple layers or feature classes are specified, a field named NEAR_FC is added to the input table and will store the paths of the source feature class containing the nearest feature found. The same feature class or layer may be used as both input and near features. The radius used to search for near features. If no value is specified, all near features are considered. If a distance but no unit or unknown is specified, the units of the coordinate system of the input features are used. If the Geodesic option is used, a linear unit such as Kilometers or Miles should be used. Specifies whether x- and y-coordinates of the closest location of the near feature will be written to the NEAR_X and NEAR_Y fields. NO_LOCATION — Location information will not be written to the output table. This is the default. LOCATION — Location information will be written to the output table. Specifies whether the near angle will be calculated and written to a NEAR_ANGLE field in the output table. A near angle measures direction of the line connecting an input feature to its nearest feature at their closest locations. When the PLANAR method is used in the method parameter, the angle is within the range of -180° to 180°, with 0° to the east, 90° to the north, 180° (or -180°) to the west, and -90° to the south. When the GEODESIC method is used, the angle is within the range of -180° to 180°, with 0° to the north, 90° to the east, 180° (or -180°) to the south, and -90° to the west. NO_ANGLE —The near angle values will not be written. This is the default. ANGLE —The near angle values will be written to the NEAR_ANGLE field. GEODESIC —Uses geodesic distances between features. This method takes into account the curvature of the spheroid and correctly deals with data near the dateline and poles. The following Python interactive window script demonstrates how to use the Near function in immediate mode. The following Python script demonstrates how to use the Near function in a stand-alone script. # Description: Finds nearest features from input feature class to near feature class. The following Python script demonstrate how to convert the near angle to azimuth. # Use these azimuth angles as necessary. Demonstrates postprocessing with the Near tool's derived output. The script finds, for each near feature, which input features it is closest to. This script finds, for each input feature, a list of near feature it is closest to.